Have you ever wished you could quickly attach perfectly shaped, dazzling white front surfaces to your teeth? Guess what? You can! With porcelain veneers, you can eliminate smile imperfections in just one visit to your Brandon cosmetic dental office. 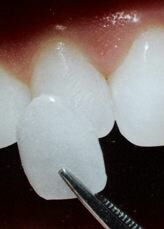 The porcelain veneer is one of the most versatile items in a Brandon cosmetic dentist’s toolbox. Veneers turn unattractive smiles into perfect smiles with minimal disruption to existing tooth structure. They are quicker and usually less expensive than complete dental crowns but are made with the same strong, translucent porcelain. It’s no wonder that a very large percentage of people in the public eye have porcelain veneers. A Florida actress can receive a perfect smile in the morning and appear on a talk show that evening. A supermodel can permanently remedy a discolored tooth and pose for photos right after leaving her Brandon dental office. A Tampa television news anchorman can have his teeth perfectly aligned in a couple hours and report Florida news that same day. I am Jeff Bynum of Five Star Dental Care in Brandon, Florida. I use dental veneers alone and in combination with crowns, inlays, onlays, and dental implants for dramatic smile makeovers. Perhaps porcelain veneers are the best route to your perfect smile. We are located at 3203 LIthia Pinecrest Rd. in Valrico. This entry was posted on Thursday, November 4th, 2010 at 7:07 pm	and is filed under Dental Veneers. You can follow any responses to this entry through the RSS 2.0 feed. Both comments and pings are currently closed.